So now we're pretty much all replumbed in copper. The water tastes funny: metallic and fluxy, and it will for a while, until the pipes develop a patina on the inside. But the water pressure! Amazing what a small change like widening the water main makes. Yesterday we suffered through a day without water, and at the end of the day they had connected the new plumbing (but not the new water main) to the supply. Here's a pile of all the old galvanized steel pipe they ripped out under the house, a tangled mess of pipes that were badly installed and flaked rust into the lines all the time. So glad to see that leave. The new plumbing looks very clean: the simple things like having the pipe sizes step down the right way to serve all the fixtures really do make a difference in a plumbing system. We were lucky that all our plumbing at the moment is on the first floor, and easily accessible from the basement and our tall crawlspace. I'm guessing that saved us some money on the job. 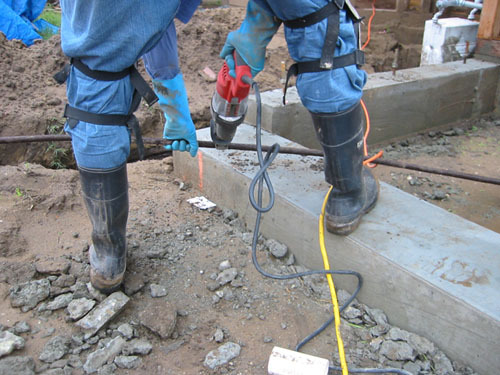 This morning the guys connected the new main to the meter. 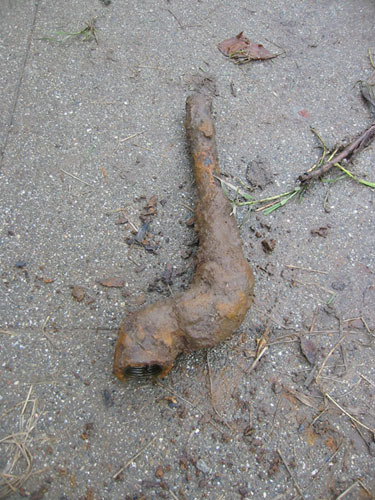 This is what the old connecting pipe looked like. Maybe we should save it for our house museum. NOT. They pulled out and cut up the old water main, which was basically trash anyway. Our shiny (literally!) new water main. Soon to be buried. The other thing the guys did today was move the water heater to its new location, more central to where all the plumbing is going to end up. 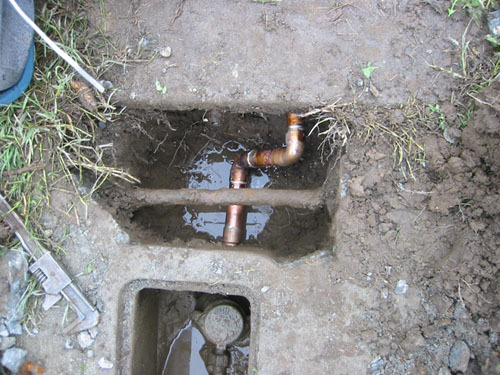 Here are the pipes going down to where it was installed; we didn't take a picture after it was put in. In other news, yesterday I went and ordered our traditional Christmas dumpster from the trash company. Some people are coming and looting through the wood pile, but when they're done with it, anything left on New Year's Day is going in the trash. Plus a bunch of other junk from the yard. Some families have a tradition of building snowmen, some roast chestnuts on a fire, some just gather and sing Christmas carols. For us, on the other hand, it doesn't feel like Christmas without a full dumpster, a bottle of wine, and a thrown back. The plumbing looks great. The only question I have is this: It looks like the pipe from the main to the inside of your place is 3/4" or 1" but the pipe where you are branching off lines to the fixtures looks like it's 1.5 or 2" (with a reducing coupling down to 1/2"). Why did it go from smaller pipes to fatter ones? Or is that just the way the pics make it look? 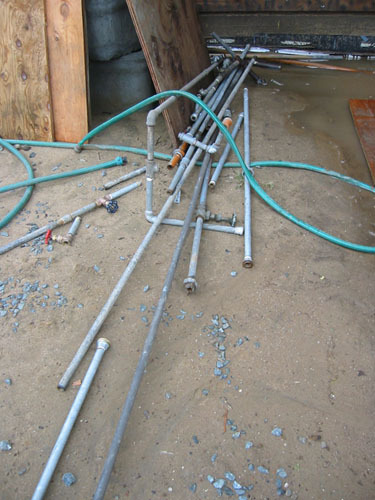 I am having a lot of plumbing "issues" too, which I am chronicling on my site. 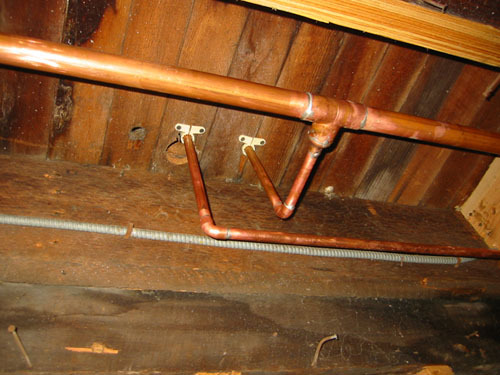 (i just started it) I'm thing about getting rid of some of the HUGE black pipe in my basement (connected to the furnace) and replace it with copper. I'm sure it's wasting a lot of energy to heat up those pipes before they get to my radiator, but that stuff is heaaaaavy, so I am reallllly putting it off as long as possible. Great blog, though! Actually, the pipe from the meter to the house is 1-1/2" (I think the scale is hard to read because it's so much bigger than you expect a copper pipe to be), and it steps down nicely from there. That was one of the problems we used to have: the plumbing was mostly all the same size in the house, and on occasion it got bigger for no good reason, so our water pressure was weak on its best days. And I know what you're talking about with putting off redoing plumbing. It's not just running the new pipe, but the guys spent half a day down in the basement cutting out the old stuff, and for us it was mostly 1/2" pipe (not so bad). Then again, copper's not going to make the pipes more efficient: it's a great conductor, so unless you insulate the pipes, you'll still be losing a lot of heat through them. How is it you decided to go with copper? Are there other choices, pvc for instance? I'm wondering if other choices exist due to the conductivity of copper. 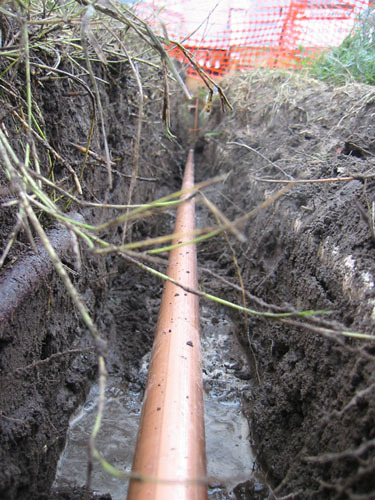 Well, copper is sort of the gold standard for plumbing. 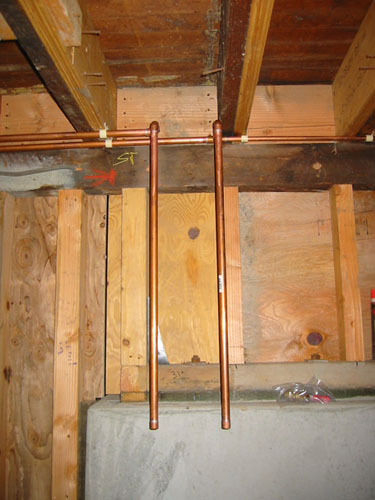 I'm really interested in PEX tubing systems for water, but the good plumbers we've talked to all feel more confident in copper, and PEX is harder to get through in California because it's non-standard. We decided not to push it with the city, but we may do some PEX tubing for the bathroom work we have coming up. PVC is not allowed for supply lines, so that was not an option; it is allowed for vent lines, so that's what we're doing as we replace the vents. I just spent three hours reading the last year of this -- I'm so glad I did not find your blog before we bought our house! But it is inspiring. I'm wondering how much the new plumbing cost you: we have the exact same problem (1/2" galvanized) in Oakland, and I've been trying to ignore it. (We also need a new foundation, but I'm really ignoring that now). I'm actually not sure; I think it was a few thousand dollars, but I'm not sure where on the continuum from 3-5 it might be, say. Keep in mind that we have no second floor plumbing at all; we have a bathroom up there but it is temporarily disconnected while we get permits together to redo it. That makes plumbing work a lot cheaper. ETA: Noel tells me it was $4500 for everything (replace water main and all pipes, redo all venting, redo sewer drain inside house).